Welcome back to the Valentines Day Social! If you are just now joining me, I have been completing one simple project every day for a Valentines Day Party. Whether it be decor, seating tags, cupcake charms, etc there will be something different and fantastic every day so be sure to check back frequently! Also, as a grand finale, you will get to see it all come together for the Valentines Day Social! 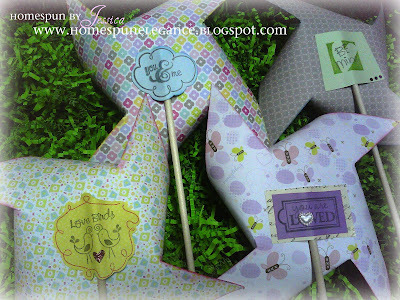 Over at http://decoratetocelebrate.blogspot.com/ is a Valentine's Day Party Challenge!! WOO HOO!! How fitting!! They have some fantastic inspiration for Party and Event Decor!! Wish me luck!! As I had mentioned, my Mom stopped by last Monday and we started on a few of the Valentines Day items. We had so much fun! Then she brought out these 1999 I love remembering magazines that she had scored for me for inspiration, and she saw some pinwheels and was oooohhhhhing and aaaawwwwwing :) She wanted some for her Sun Room. Well here you go Mom! We hope that you enjoy! Happy Valentines Day! These were cut into 6.5 inch squares and cut 2.5 in on a 45 degree angle (with my Martha Stewart score board). I used my ATG gun in the center ALL OVER - This part was so important - like an inch around - don't use glue - and use hemming pins and punch through each individual (4) corners that are pulled into the center until it sets. Bling the center out with whatever you have on hand to hide the holes from the needles. As always I sure love hearing from you so please feel free to leave a comment or just say Hi while you are stopping by! 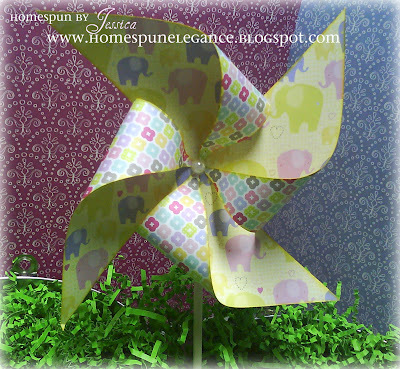 These pinwheels are adorable Jessica! I'm looking forward to seeing the final pics of your Valentine social come together.... looks like fun already!! These are so beautiful!! 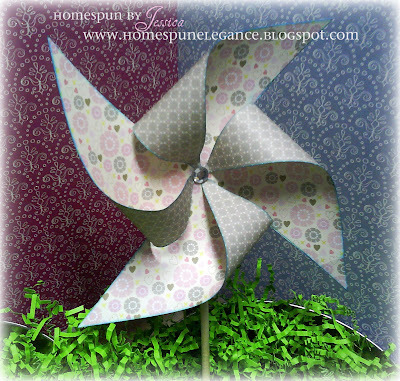 I love the pretty papers you used!! Thanks so much for playing along at Decorate to Celebrate! Love these pinwheels. Thanks for playing along with us at Decorate to Celebrate.